The wildlife that can be seen in the sanctuary include the elephant, sambar, barking deer, mouse deer, porcupine, wild pig, nilgiri langur, common langur, wild dog or dhole, monitor lizard, flying lizard, flying frog, flying snake, king cobra, python, flying squirrel, malabar squirrel, birds such as darter, kingfishers and gray hornbill. Entrance Fee: Rs. 10/- for Indians. Rs. 50/- for foreigners. Timings: 0600-1800 hrs. Note: Permission for video, TV and cinema shooting can be obtained from the Chief Conservator of Forests & Wildlife, Vazhuthacaud, Thiruvananthapuram - 695014. The following picnic spots are approachable by motor launch or bridle path in the forest:- Manakkavala 10 Km., Periyar Dam 12 Km., Crusoe Island 19 Km., Pavarasu 19 Km., Mullakudy 29 Km., Thannikudy ( core area of the park, permission and guide to be taken from the Forest Department) 39 Km. Vandanmedu (25 Km.) : Situated at an height of 4000 ft., it is the largest producer of cardamom in the country and has several tea and spice plantations as well. Accom :Rixon Resorts Carmelia Havens Hotels & Resorts, Tel : 0486- 870252/272. (Rs.1500 - 3500/-). Peermade (40 Km.) : Peermade at an altitude of 914 mts., is a small hill station on the way to Thekkady.The place is full of rubber, coffee, pepper and cardamom Plantations. Accom : *Thrisangu Haven**, Tel : (0486) 332491/ 98 (Rs.1600-2750/-); Hotel Himrani Tel: (0486) 332288 (Rs.200-600/-). Area : 777 Sq. Km. Altitude : 900 to 2000 Metres. Temperature : Summer Max: 29 Deg.C. Min: 18.0 Deg.C. Winter Max: 21 Deg.C. Min: 15.5 Deg.C. park remains open throughtout the year. Air : Madurai (140 Km.) and Kochi (190 Km.) are the convenient airports. Fare: Mumbai-Madurai: Rs.6910/-(Y); Mumbai-Kochi: Rs. 5990/- (Y). (114 Km.) is the most convenient railhead. Fare : Mumbai - Kottayam : IInd A/c : Rs.2123/- ; IInd class : Rs. 489/-. Km., Kochi 190 Km., Kottayam 114 Km., Madurai 140 Km., Munnar 113 Km. 1. The Forest Dept. & KTDC operates boat cruises on the lake to see wildlife in the sanctuary. Timings: 0700 hrs., 0930 hrs., 1130 hrs., 1400 hrs. & 1600 hrs. Fare: Rs.60/-for Upper Deck, Rs.35/-Lower Deck. Resvn: Forest Dept, Thekkady, Tel:322028 & KTDC, Hotel Aranya Niwas, Thekkady. 2. 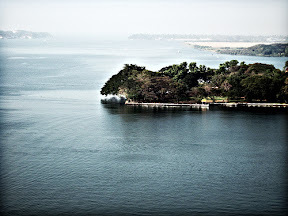 Special boats for cruise on the lake can be hired from KTDC, Hotel Aranya Niwas. a) The Forest Department arranges trekking programmes in the forest areas of Thekkady daily from 0700 hrs. Fare : Rs.10/-. Check post entry fee is to be paid extra. Bookings can be made with the Wildlife Preservation Officer, Tel:322027.
b) Elephant rides can be arranged through the Forest Officer, Tel: 322028. Time:1000 to 1700 hrs. Duration of a trip: 30 minutes. Fare: Rs.30/- per person. 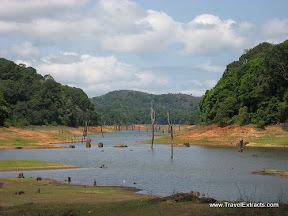 Thekkady, Tel: 322023 . Fax : 322282. 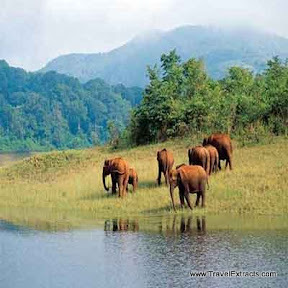 Thekkady, Tel : 322401-7. Mumbai Contact Tel : 2022626. (i) *Hotel Kumily Gate**, Tel : 322279, (Rs.550-1000/-) ; *Michaell's Inn**, Tel : 322355 (Rs.1300-1700/-); Hotel Lissiya International, Tel : 322288, (Rs.350-1400/-); Mukkumkal Hotel Regent Tower, Central Junction, Tel: 322570 / 670 / 970 (Rs.250-1000/-); Shalimar Spice Garden Resort, Tel : 323022, (Rs. 3450-5150/-). Holiday Home, Tel : 322017 ; Lake Queen Tourist Home, Tel: 322084 / 86 ; Hotel Leela Pankaj Tel: 322392, (Rs. 500-700/-) ; Mukkumkal Tourist Home,Tel: 322070; Wild Side Villa, Amalambika Road, Tel:545202. Forest Department Cottage, Thekkady. 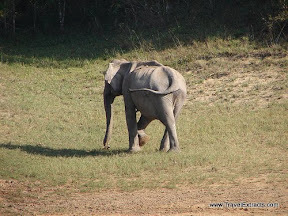 Resvn: The Wildlife Preservations Officer, Forest Information Office, Thekkady-685536. Tamil Nadu PWD Inspection Bungalow,Thekkady. Resvn: The Executive Engineer, PWD Periyar Project, Tallakulam, Madurai.